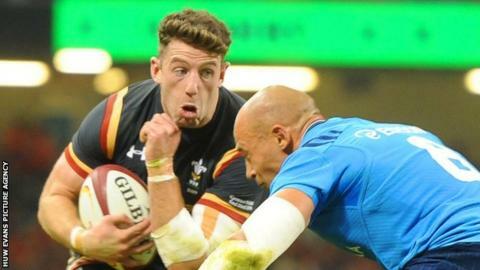 Wales wing Alex Cuthbert has vowed to rediscover his form at the World Cup. The British and Irish Lions player has been criticised after a 2014-15 season in which he was dropped for Wales' Six Nations win against France. But Cuthbert, 25, hopes to return to his best as Wales prepare for their World Cup opener against Uruguay on Sunday, 20 September. "It's only going to be one or two games from being back to where I was before," said the Cardiff Blues player. "Obviously, I haven't had the rub of the green, but I'm still working hard in training. "I've shown in big games and in big tournaments in the past that I can come good. It's no different." Cuthbert has scored 15 tries in 35 appearances for Wales, including one in the 2012 Grand Slam clincher against France and two as Wales thrashed England to seal the 2013 Six Nations title. The 6ft 6in wing has been off-colour recently, however, touching down only once in his last seven Tests. He endured a torrid afternoon in the World Cup warm-up win against Italy, throwing an intercepted pass and missing a tackle in the build-up to the Azzurri's try. Now Cuthbert has his sights set on a first World Cup appearance against Uruguay. "I've been looking forward to it since I first came into the squad [in 2011]," he said. "I've always had my eyes on the World Cup. I just want to get out there and put a performance in at the start and hopefully build on it in each and every game. "We want to get the result because it's all about momentum at the World Cup. The boys said at the last World Cup you build from the first game and it follows on from there." With fellow outside backs Leigh Halfpenny and Eli Walker ruled out of Wales' squad with injury, Cuthbert has a strong chance of securing a first-team place. But the wing is sad to see Wales and Lions team-mate Halfpenny miss out. "He's a world-class player and you want to see your best players in the squad," Cuthbert added. "Rugby is a cruel sport and a lot of top-class players have suffered bad injuries. Hopefully Leigh will bounce back stronger. "He's given 100% support to us. We'll be speaking to him over the next few weeks, supporting his experience and he can help young guys out like myself during this tough four or five-week period."